NEW ORLEANS (CNS) — While the ministry of the deacon has changed in the Catholic Church’s history, Cardinal Joseph W. Tobin of Newark, New Jersey, said deacons today are a sign of what Christians are called to be in their service of God and neighbor. Cardinal Tobin traced the permanent diaconate’s restoration to its mention at the Council of Trent in the mid-16th century. Five centuries later, the Second Vatican Council finally implemented it. “In 1967, Pope Paul VI officially reinstated the permanent diaconate,” Cardinal Tobin said. Pope Paul, who oversaw the completion of Vatican II after the death of Pope John XXIII, who had convened it, gave three reasons for reinstating the diaconate, the first rank of holy orders: to enhance the church, embellish it and increase its beauty; to strengthen for the sake of others, those men already engaged in diaconate functions; to provide assistance in areas of the world suffering from clerical shortages. 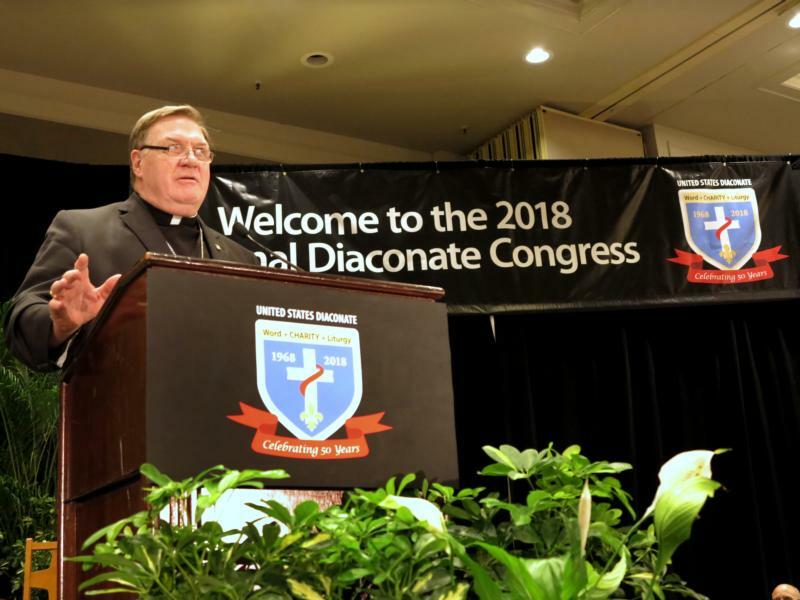 Within a year, the U.S. bishops received permission from the Vatican to institute the permanent diaconate on American soil. Cardinal Tobin said the growth was rapid — 1,000 deacons nationwide within a few years. Today, there are 18,500 deacons in the United States, representing half of all deacons in the world. Are deacons necessary today? “The answer must be a resounding yes,” Cardinal Tobin said. “And, not simply as a steppingstone to the priesthood or as a remedy to the shortage of priests. He thanked deacons for putting flesh on the diaconate of today’s church and their wives for unwavering support. He believes in a double miracle of Pentecost from which the order of deacons emerged. The foundational diaconate elements take scriptural root in the sixth chapter of the Acts of Apostles when the disciples selected seven men of good reputation and strong faith — such as Stephen — to continue their ministry. These heard the word of God and spread it through charitable acts in their own culture. “This modeling highlights the nature of the sacred character, the permanent mark that comes upon a deacon at his ordination,” Cardinal Tobin said. Those in the audience laughed when he mentioned that the deacon, not the priest, even if it is the pope, has the last word at Mass in dismissing the faithful. Cardinal Tobin implored deacons to follow Pope Francis’ words in his apostolic exhortation “Amoris Laetitia” (“The Joy of Love”) to empower marriage and family life. He said deacons and their family could contribute to the life of the church through their sacrament of marriage. He repeated St. John Paul II’s words about the unique challenges and contributions that a deacon and his wife make to the church. He believes permanent deacons have a second gift: to close the chasm between faith and love, a chasm that divides the Eucharist from daily life. By their “deceivingly simple gesture” at the eucharistic table dismissing the assembly at Mass’ conclusion, he believes deacons can close this gap. “It is the deacon who has the final word: ‘The Mass has ended, go in peace,'” he said. Bordelon is associate editor of the Clarion Herald, newspaper of the Archdiocese of New Orleans.